North won the GolfKings Scottish men's area title at Cawder Golf Club, Glsgow today with a hard-fought 5-4 win over Fife in the final. It is 18 years since North last won the national title at East Kilbride in the year 2000. 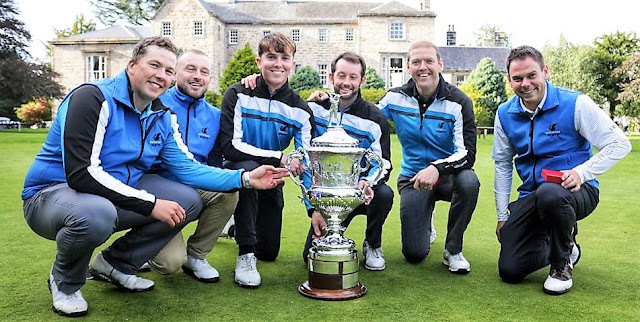 North, 3-2 conquerors of North-east in the semi-finals, looked on their way to a runaway victory in the final when they won all three morning foursomes but the Fifers hit back in the singles which they won 4-2. Wins by David Joel and Chris Gaittens proved vital for North in the final set of singles. In the last 20-odd years, North have won the national title at Edzell in 1995 and at East Kilbride in 2000. With six points up for grabs in the afternoon singles session, Fife responded to win the opening three matches after victories from James White, Greg Wishart and Andrew Davidson. The two teams traded one more point each to make it 4-4 with wins for Scott Crichton (Fife), 4 and 3 over Lewis Reid, and Chris Gaittens (North) defeating David Mitchell jun 6 and 4. It all came down to the match between David Joel (North) and Fraser Carr (Fife), which went right down to the wire with Joel winning by one hole to claim a 5-4 victory for North overall. Moray’s Kyle Godsman said: “It’s a big honour to represent the North District and to come out as the winners gives us a feeling that is difficult to put into words. Peter Abbott, Secretary of the North District, said: “I am very proud of the team today. We would like to congratulate Fife Golfing Association on a great tournament, they played very well and it was a tight game that went right down to the last putt on the last green. Reid and Gaittens bt Mitchell and Crighton 1 hole. Wright and Shaw bt Wishart and Davidson 2 and 1. Godsman and Joel bt White and Carr 3 and 2. Godsman lost to White 3 and 2. Wright lost to Wishart 4 and 3. Shaw lost to Davidson 3 and 2. Joel bt Carr 1 hole. Reid lost to Crighton 4 and 3. Gaittens bt Mitchell 6 and 4.